Scroll to the end of this verbose post for a chard stew recipe--it's a great basic template, one of those big pot meals you can throw just about anything in! The theme of our backyard garden this year has definitely been baby steps, in more ways than one. Although my husband Dave and I celebrate local, seasonal food and are inspired by goals of sustainability, neither one of us has ever possessed much of a green thumb. On the contrary, I'm pretty sure I've even managed to kill a cactus. This year, however, a recurring incident with our neighbors, whose yard joins ours at the back, provided the ultimate catalyst for getting in gear, and finally producing long talked about raised beds. Our yard slopes down slightly to meet our neighbors, who unlike us, are devoted gardeners. Our Coloradan clay soil makes regular watering a requirement to maintain the much coveted green lawn, and also results in inevitable runoff. After one too many conversations with the neighbors on the topic of their drowned plants, we decided to give up on grass. We'd reduced watering to the point it had grown sparse and brittle already, and the talks were getting tedious. They'd progressed from affable over-the-fence chats to front-door discussions when our aggrieved neighbor formally drove around the block to our house, as if to apply some distance to an unpleasant task. Our response had gradually morphed from sincere regret to stony-faced irritation. Project no-grass had its inception. Putting in the raised beds was a lot of work (for Dave) initially, but it was so worth it. The ground needed to be leveled, wood selected and constructed into carefully measured boxes, and barrow upon barrow of rich, healthy soil was lugged down the awkward slope to its new home. Even without any plants, the back yard was transformed. From weed-ridden barrenness, all of a sudden there was a sense of order and promise. Of course, being fresh and naive, there were plenty of learning experiences to gain from, especially when it came time to plant. Throughout the winter, before we'd put up wire fencing around the two beds, we noticed a rather large rabbit literally romping around in the dirt of one. This was no casual occurrence. The big bunny was seriously pawing and kicking away in the soil, rolling like a frisky dog. It was a bit bemusing, if odd. Perhaps we should have been more on the alert, but we just shrugged and let it go. When spring frosts had subsided, we squared off sections of each bed with string, and planted a mix of seeds and seedling plants, which we immediately protected by erecting the wire fencing. The first day, Dave purposefully left one edge of the fencing loose, so we could pull it open like a door if we needed added reach. Nice idea, but it not to be. The next day, I looked outside, and the now enormous bunny was honestly bashing its bum against the loose edge, forcing a wide gap. It then planted itself in its favorite, central spot. Oh no! Our plants! I felt a budding sense of panic. I rapped on the window, but the stubborn rabbit wouldn't budge. Next, I ran outside, and at the last minute, the hare did obligingly remove itself. That evening we secured all the edges of the fencing. Phew. Battle won. Or not. The next morning, I opened the curtains and looked out, and there was the bunny, squat in the middle of the bed as before. We were seething. This was no longer a velveteen rabbity bunny, or the likes of a Beatrix Potter creation. This had progressed to a Donnie Darko bunny-nemesis, back to torment having traveled through some mysterious distant portal. Groaning, Dave went outside for battle number 2, but was stopped short in his tracks. First point we'd overlooked way back in the fall, we hadn't thought to lay down wire mesh to prevent burrowing and reduce weeds. The bunny had created a burrow in our bed. Leaning in for a closer look, Dave saw its edges, and blindly poking their little heads out, 4 baby bunnies! Beatrix was back. What could we do? Leave them alone, gardener friends said sympathetically. Soon they'll be gone, and they probably won't even touch anything. So, we waited. What else was there to do? Amazingly, our indolent-feeling patience was rewarded. Within a few days, the rabbit family was gone, and the bed was remarkably intact. But before long, it was our (my) turn to be a little bit babyish about the garden. Unusually frequent rainfall made for a strong early growing season. One day, it seemed like the plants had burgeoned, almost uncontrollably. The tomato patch was a veritable jungle, and the squash and pumpkin were insane in their umbrella-like takeover. It was thrilling to watch, and so satisfying to be part of. In weeding and watering, I felt this new contact with the earth, and that created this organic, unexpected calm. With it too came this weird, almost maternal instinct, and when it became apparent that our flourishing plants needed to be plucked, pulled, trimmed, and cut, I kind of revolted. At the same time, I couldn't help but laugh at myself. The whole purpose of the garden, after all, was eating the produce, becoming more sustainable, reducing the grocery budget. What a waste to just let food ripen, over-ripen, and finally decay, unused. Still, it was initially a tough step to take, like severing oneself from a safety net. As when faced with most dilemmas, I figured one sensible strategy to get myself past this mental barrier was to educate myself, and when I launched into reading about harvest methods and timelines, two things really grabbed me most productively. First, the old reliable Miracle-Gro Complete Guide to Vegetables, Fruits & Gerbs, along with just about every source available, reminded me that plants generally need thinning to encourage healthy growth, of course. It's like giving yourself a haircut. Plenty of resouces emphasized the importance of harvesting your produce, and I began to feel a little ridiculous for having pangs about this. The other particularly helpful quote came from "Tips for the Lazy Gardener". One of my gardening friends quips, "I don't like to harvest. I just like to grow", it reads, going on to add, At least once during each season, most of us share that sentiment. Yes! I wasn't such a sentimental freak. Everyone naturally feels this way, I thought. Until I read a little more. The book followed up with tips to make harvesting less tedious, including involving the kids. What!? I don't dislike harvesting because of the work load! I'm sappy, but I am not lazy! True, I did buy a book entitled "The Lazy Gardener", but that was just because we weren't accustomed to carving out time for gardening, not due to slothfulness. Don't you know I'm training for an Ironman, I wanted to rebuke the book, irritated. Armed with my annoyance, I finally turned attention to picking produce, and found, to my relief, if was fun! I like to plan meals a week in advance, allowing for one big shop and a grocery budget easier to stick to. But growing your own produce lends a new challenging dynamic. It opens up new creative opportunities in your cooking. You can't predict exactly what you'll have and when, but you can open your mind to new ways of making use of the resources at hand that fit your weekly needs. This first real "pick week", one astonishing bloomer was chard. The outer leaves were getting a little limp and dry in patches, and begged to be picked to allow for tender, inner leaves to grow. I picked a bunch, and tweaked a recipe I'd had from Cooking Light, making use of other items on hand that would could otherwise go to waste. The result was the tasty stew below. I had leftover lean ground beef, cooked, from a previous night. I used the whole chard plant, chopping the stems and tearing the leaves. A lot of recipes call for leaves only, but I really like the stems. They're kind of like celery, absorbing flavors and liquids, but with a more delicate, less distinct flavor. Next time I might try a vegetarian version, replacing the meat with a grain, like bulgur or couscous. Another day I might try ground or chopped chicken or turkey. Curry and turmeric could also be good alternative seasoning. The chard was delicious--really tender and delicately flavorfug, having been picked fresh and traveling merely up the steps of the deck into the kitchen. Depending on what produce was bursting and ready, this recipe is of those than could handle just about any variety of greens. In a large saucepan, saute onion and garlic 1 minute. Add meat and saute to brown. Add tomato paste; cook 1 minute. 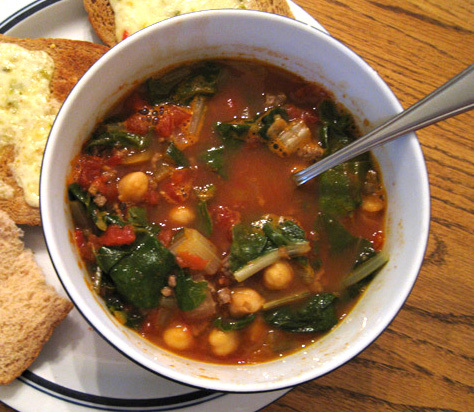 Add chickpeas, chard, and remaining ingredients; bring to a boil. Reduce heat, and simmer 15 minutes before serving.